first V. Decided on a 58 reissue as I like that the toggle switch placement is more accessible than on some other models and how the upper body is cut away where it joins the neck. The neck has some dive that would be corrected by moving the strap button behind the neck, but with my right arm rested against the body it's not a problem for now. Pickups are microphonic, which I'm guessing would be accurate to the original 58's...don't know if they were waxing them or not in 58?...might leave them as is and enjoy playing with the feed back or I might wax them over the Christmas holiday. This is an Epiphone Korina 58 reissue. found it with the case online through Guitar Center. They rated it as "very good" condition and thankfully it is very good or slightly better. Only thing I did was add schaller strap locks. I don't know if this is a Chinese or Korean version as the origin is not indicated on the back of the neck. Only pic I have for now is the one from GC. edit: checked the serial number and it appears to be manufactured in Korea during December 1997 (for the 1998 model year) I believe that might have been the first year that Epiphone reissued them. Very cool. It's crazy to think that design was around in '58. IIRC it will have Epiphone's version of the Gibson '57 Classic pickups, which I don't think are potted. BTW, you can tell it's either Korean or Japanese because of Gibson being printed on the truss rod cover (assuming that the cover is original, which in your case of course it is). Always liked both the Korina models and should have taken my chances back when they were much cheaper second hand. I like the Explorer a lot. If I really wanted another guitar, which I don't, that would be one I would go for. Nice! Reminds me of Allen Collins. Confession time: who else on the board has a V then? In an ideal world I'd have a second. I have a Steinberger GP model that looks kind of like a chopped V (missing a head stock and the lower wings.) 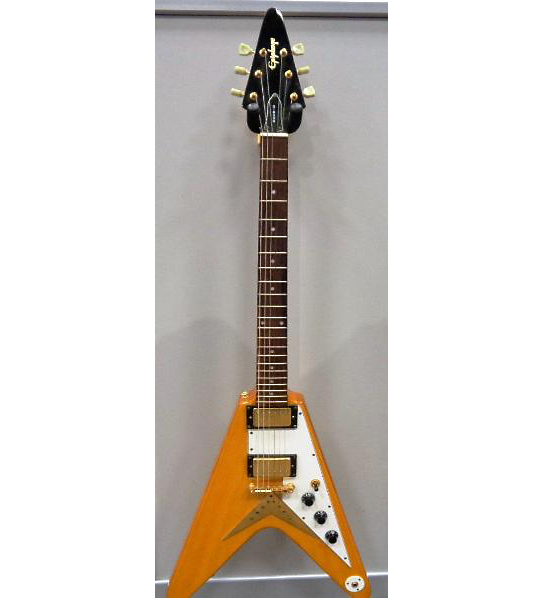 I'd love a second V too, one with the big pickguard that crosses both sides of the body, although I would move the toggle switch to the knob position closest to the bridge. I don't know if it's just the honeymoon phase of playing a new guitar or if I'm falling in love with this thing. I can't seem to put it down. Despite it's large appearance it's surprisingly lite. Comfortable standing or sitting. I'm still considering adding a strap button behind the body to balance it better. Might go to GC this week as they have a 2016 model V hanging on the wall, strap it on and see how it balances compared to mine. I tried running the lower strap over the top of the body instead of under and this makes the guitar better balanced, but makes me feel slightly squeezed between the straps and causes the upper-side of the guitar to angle in more toward my body. I adjusted the truss rod to straighten the neck and picked up some buzz at the first few frets. Raised the bridge to compensate, but still have fret buzz with the open A string. Will give it some time to acclimate to my climate, then proceed with a nut replacement and fret job if needed. I would love to hear any other V owner's experiences with theirs. Good or bad. It's always nice to shorten the learning curve. I bought a >TGI case<. It doesn't support the neck properly. Hope there wasn't any neck damage associated with the case. One is similar to this Korina model but an old unknown Japanese model, the other is a Rhoads shark fin type of V.
Great guitars but sometimes too much effort to play in the house. Much easier to sit with the Duo Sonic or Tele. I'd do the Korina V or Explorer, but yeah they're like 10 and 11 in line of the guitars I want but will likely never have.